The midsize Volkswagen Passat has a lot of competition within the segment and also has a lot excess baggage to shake thanks to the Dieselgate scandal associated with many of Volkswagen’s diesel (TDI) vehicles, of which the Passat was one. But, to be truly objective and fair, the Passat has managed to overcome all of those obstacles and still comes to market with a strong midsize contender. This week, I drove the 2016 Volkswagen Passat SE with the Technology package. I openly admit my previous impressions of other Passats was less than impressive. With all that on my mind, it should be more impressive than I can say that the 2016 Passat is the most impressive Volkswagen sedan I’ve driven in recent years. Despite the 2016 model year having few changes, the Passat manages to impress with conservative, but timeless looks, a spacious interior that teeters on luxury and a fuel efficient, but fun-to-drive car. 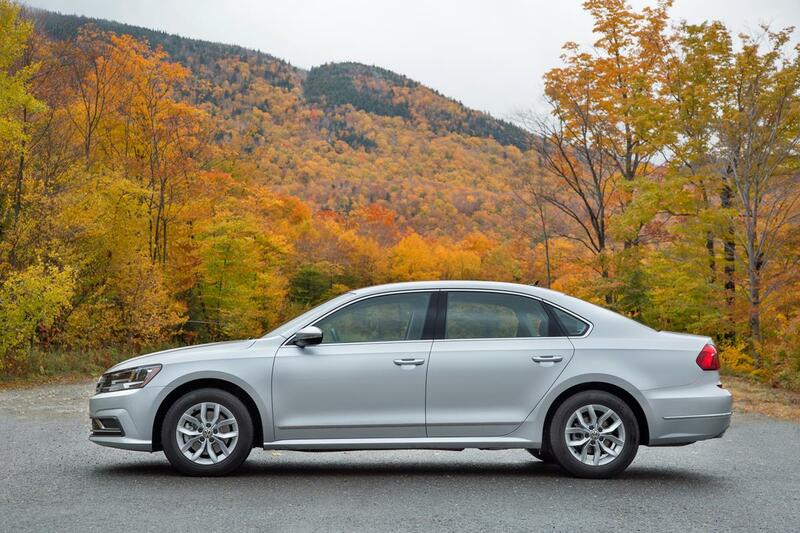 For 2016, only a few cosmetic changes have been made, but those slight changes make the Passat more appealing. The Passat now has LED head and tail lights. It really makes the Passat vibrant and stylish at night. The front end has more style including a more chiseled grille. Chrome accents around the windows add some pizzazz to the otherwise conservative Passat. Conservative styling is standard for most cars within the segment, so Volkswagen playing it safe with the Passat is not a detriment. The Passat is offered as a turbocharged 4-cylinder and a standard, more powerful V6. My tester was the impressive 1.8-liter turbocharged 4-cylinder which makes 170 horsepower. While those output numbers are mind blowing, the Passat is actually a brisk performer with rapid acceleration and phenomenal performance in the lower RPMs. 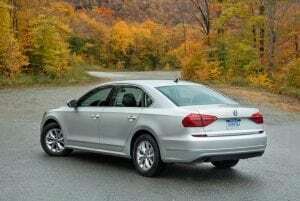 A six-speed automatic transmission is a little slow to respond and certainly needs an update, but other than that, the Passat has more pep than other cars in the segment. Doing so in a small, turbocharged engine makes it that much more impressive. 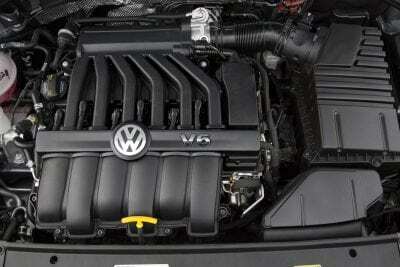 The 3.6-liter V6 is the way to go for more horsepower as it makes 280 hp. But for the right combination of fuel economy and performance, the 1.8-liter Passat is the ideal option. Inside, the Passat really impresses. I don’t remember any Volkswagen sedan being as nice as this Passat. It almost looked like an Audi with high quality materials and nice aesthetic touches like faux wood and leather accents. Plus, leatherette seats offer comfort an ideal seating angle. The back seat has copious amounts of legroom. Two adults and a child could sit in the back seat in comfort without complaining about shoulder room or legroom. Headroom may be limited for passengers over six feet tall. The touchpoints on the dashboard and the side panels are outstanding. My tester had a leather-wrapped steering wheel and shifter. For a vehicle priced under $30,000, there isn’t a nicer interior. Compile that with the spacious cabin, and it’s an excellent family vehicle or daily driver. The Passat has 15.9 cubic feet of space in the trunk and storage space can be expanded thanks to 60/40 folding rear seats. The infotainment is much improved from the previous model year. Gone is the MDI converter they offered, replaced by a USB connection for smart phones. Plus, the infotainment system integrates smoothly with all devices through Apple Car Play and Android Car. Both of these features are new for this model year. A 6.3-inch touchscreen is responsive and intuitive. As is the case with many German brands, there are many trim options and packages. While this can be overwhelming for the consumer, even the basic Passat comes with plenty of standard features. My tester was the SE trim with the Technology Package. It had a base price of $28,410. 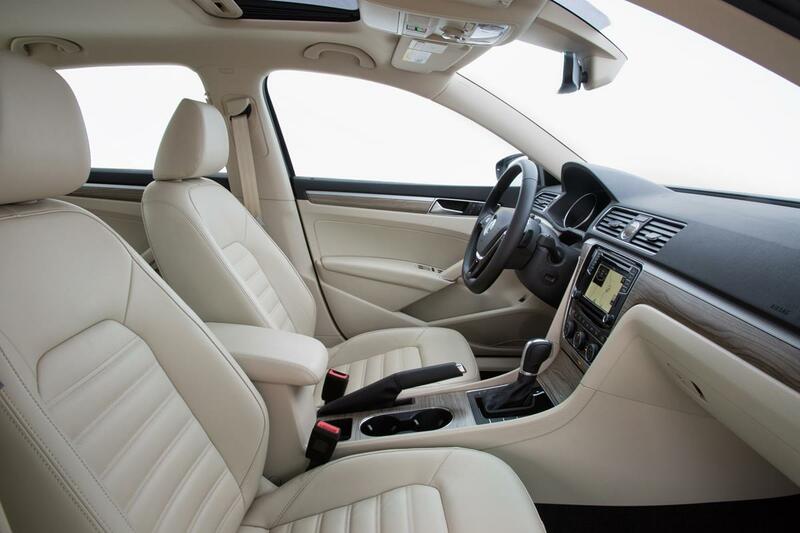 The SE comes with the leather interior and faux wood accents. Add in the technology package which includes a hands-free trunk, which opens with the sway of your foot under the bumper, as well as lane departure warning and blind spot monitors. My tester had a final MSRP of $30,325. Putting aside any negative publicity stemming from Dieselgate, the Passat is still near the top of the segment in fuel economy. 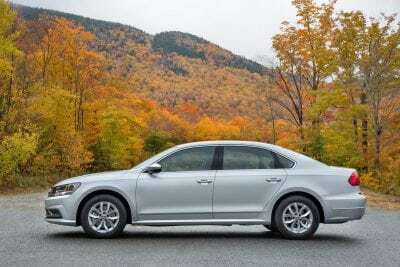 The gasoline-powered Passat has an EPA estimate of 25 mpg/city and 38 mpg/highway. In a week’s worth of heavy-footed suburban driving, I averaged 32 mpg. The Passat certainly offers a lot for a fair and reasonable price. It’s probably a necessary thing in order to market this quality, family-friendly midsize sedan. 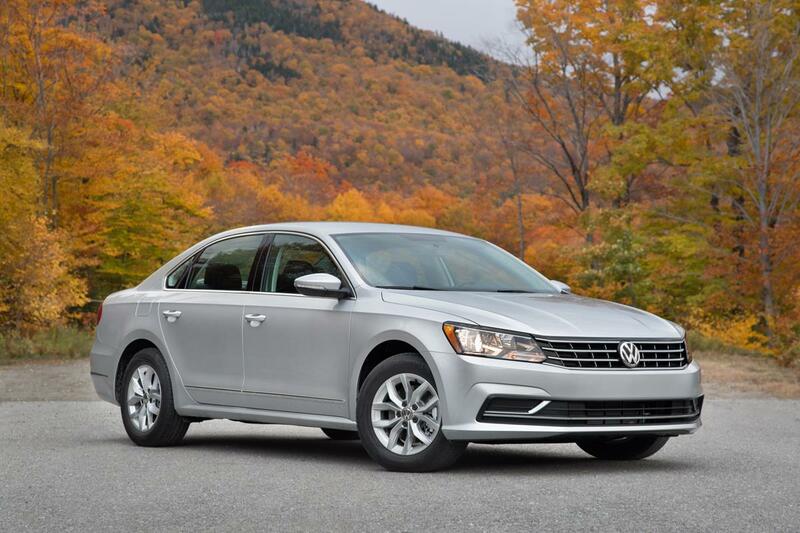 All preconceived notions aside, the 2016 Passat is a contender in an ultra-competitive segment. I know some people that had two VW Passat Diesels. Hard to hear “VW Passat” without thinking of Dieselgate Jimmy. Wonder if the Volkswagen will ever shake the scandal? For my part, I’m not sure they will. Stains like that never completely go away and can take decades to get back to normalcy. When I scope the amount of PR and image buffing campaigns they are throwing out simultaneously, I don’t see much is coming out of VW but: “We’re going to do this!”. “We’re going to do that!”. Although, it’s obvious such a huge company cannot turn on a dime, in the meantime they do what German carmakers do best… PR and Marketing. Oh yeah Baby, I’m making enemies 🙂 But don’t worry. The Giulietta will give VW, Mercedes and BMW the motivation to go back to their roots with light and efficient cars, the opposite of today. Oh, yeah, enemies, I will make. Quiet Yoda!